Are you looking for super watches? Then you are probably interested in what this brand new replica store has to offer. Watchsupers.com is its name and it promises top quality at excellent prices. Sounds pretty good, isn’t it? This is why, today’s review is dedicated to the products and services it offers. The design of its website is indeed very complex and attractive. The homepage features a very modern and friendly layout that is also surprisingly intuitive. The color scheme is black and red, there is a dark background, a wide intricate static banner, a top menu bar and a secondary brands’ list under the banner. 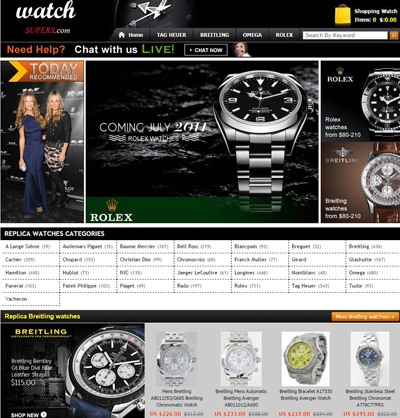 And if you scroll down there are also a couple of sections dedicated to Breitling, Rolex and the Sponsored Products. Even though the website has so many various elements, somehow it manages to feel easy on the eye and very friendly. Another highlight of this company is that it offers so many different brands. Maybe there are only 4 brands in the top side menu bar, but the company carries many other famous designer names as well. Chopard, Bell&Ross, Cartier and Panerai are just a few of the important names featured on this site. And as you would expect from any important replica watches merchant, in each category it includes a couple hundred different watches. Luckily, these are all divided into subcategories- a trick that makes browsing easier for us, but not enough if you ask me. I prefer websites that have an easy to use Advanced Search option so you can filter the products by using different criteria. The really strange thing about this replica watches stores is that it sells only Japanese replica watches. I have browsed most of its products and I couldn’t find any Swiss ETA fake timepieces. The prices for Watchsupers.com’s automatic movement 21 jewels Japanese Miyota replica watches vary between $150 and $250. Basically, this is the average price range available for these kinds of products on the World Wide Web. There is no doubt about it, this company isn’t using its own product pictures. How can I be sure about this? Easy! I just need to take a look at a couple of its products. There are at least 4 different types of pictures taken in different studios. Plus, none of the replica watches has additional pictures. There is only one main photo per product. By the looks of it, the merchant has copied the images from a couple of different sources and put them together as to make us believe that he is trustworthy. But who knows? It is possible that it doesn’t even have its own stock. I like the fact that Watchsupers.com offers a broad range of payment methods. On its payment form we have the options of paying by Visa, Mastercard, Western Union or Bank Wire. In most cases, credit card is the most recommended choice because your bank guarantees the security of the transaction, but as in this case the page isn’t encrypted and protected by the https extension then I would advise you to avoid entering your card info on this site. If you know someone who has ordered from this page then you can even try Western Union or Bank Wire. Just like many other online stores, Watchsupers.com claims to offer fast delivery all around the globe, but it does this in return for a $25 shipping fee. The orders are being sent with EMS, DHL, UPS or Fedex, depending on the destination country. Usually, there is a 2-3 days delay in shipping the package as the company needs to prepare the products for dispatch, but once they are sent out the estimated delivery time is 7-10 business days. Furthermore, a tracking number will be provided so you can follow the progress of the shipment online. This merchant offers a 5 days refund or replacement policy. What they are basically saying is that if you want to return the product because it is defective or because the company made a mistake then they will pay for the return shipping fees. For any other reasons, you have to pay for all return shipping expenses. There is nothing written about a restocking fee. Also, I did not see any information on the site about a repairs warranty. The replica watch may break after the first 5 days. What happens then? Interesting enough, the website has a live chat button on the top part of the screen, but you know what’s even more curious? When you click it, nothing happens? It is just a static banner without a link assigned to it. I hate it when replica watches companies do this, when they pretend to offer a service that they do not offer. This is from my point of view a scam as well. They deceive you now and they might very well trick you later by not sending anything after you pay. Of course, there is no phone number listed. There is just an email address. I am sorry to say this, but I wouldn’t trust this replica watches store no matter how super it may sound. Ok, it has a very large and varied selection of products, affordable prices and a diversified collection of payment methods, but it does not offer proper customer service, no refund policy, no repairs warranty and no pictures of its own products. From my point of view, ordering from this place is very risky.